Many users may troubled by those problem such as default homepage changed, numerous annoying ads pop out, being redirected to other malicious websites or browser crash down without exact reason, especially if windows system had been unfortunately infected with viruses when using Internet Explorer surfing online. Anvi Browser Repair Tool is a free tool created to help you conveniently repair browser settings and networking settings such as homepage, safe startup items, DNS settings, Title Bar, BHO plug-in, etc, changed by malware to return smooth browser use. While antivirus, antimalware tool helps detect and remove malware infections from computer, this program will practically assist normalizing safe browser searching. Anvi Browser Repair Tool is designed to help fix browser, network settings altered due to rogueware/malware infections and even facilitate malware removal with one-click solution. Repair Browser Settings Changed by Rogueware/Malware: Many rogueweare or malware, especially redirect viruses or browser hijackers, tend to change browser settings, like altering homepage, startup-page, search engines, extensions, add-ons, security settings, to name a few, to redirect users to suspicious or malicious URLs. Anvi Browser Repair Tool is able to repair these browser settings to normalize safe browser usage. Repair Network Settings Altered by Malware: Networking settings like DNS settings, LAN settings, etc are often altered by rogueware, Google redirect virus, fake antispyware and the like to perform tricks. 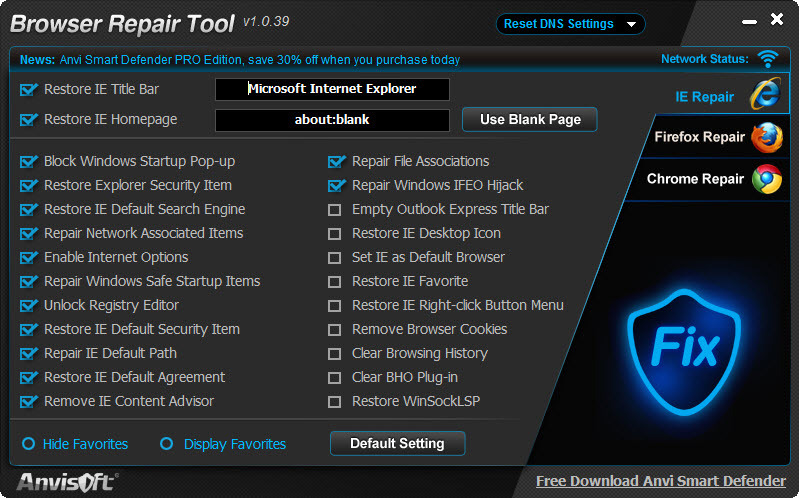 Anvi Browser Repair Tool is capable of normalizing such networking settings to enable safe networking connection in order to even facilitate malware removal together with malware removal tool. Facilitate Virus, Malware Removal: Besides repairing browser settings and networking settings altered to normalize browser usage, Anvi Browser Repair Tool can also unlock Registry Editor, restore browser default path, repair file associations, block Windows startup pop-ups and repair Windows IFEO hijacker to facilitate virus, malware removal. The software launches upon executing the downloaded executable [BrowserRepairTool.exe]. Administrative rights is required to launch the application. At startup it tried to connect to the internet. Connecting to internet is not necessary for the functioning of the application. It is required for checking news and may be updates. So, if you are not interested, you may disallow the connection attempt. The GUI is uncluttered and just has the required settings. Currently it is able to repair some common Windows and Internet Explorer settings related to malware infection. Firefox and Chrome will reportedly be supported on version 2 of the application. 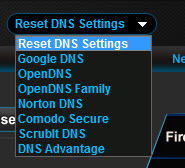 The software can reset DNS settings and also use some well-known DNS resolution service that offers misspelling correction, phishing protection, and also optional content filtering. After applying settings you may need to log off or restart your system for all the changes to take place properly. The software uses little system resource during idle time. The installer [632 Kb] is digitally signed by Anvei Technology Co., LTD. I like the application but it needs to include all the features of internet connection problems like Datum Complete Internet Repair. This entry was posted in Free, OS Enhancement, OS Maintenance, Portable, Security Related, Software, Windows.